What Is a Grooming Mower and How Should It Be Used? Grooming mowers commonly feature two or three spindles that allow operators to cut sports fields, public areas, lawns, and other large areas that need to be manicured. These durable implements reduce mowing time without sacrificing performance. Now that we know what a grooming mower is, let’s take a closer look at some of the steps that should be taken when putting it to work. Not all turf areas are the best fit for a grooming mower to pass through. 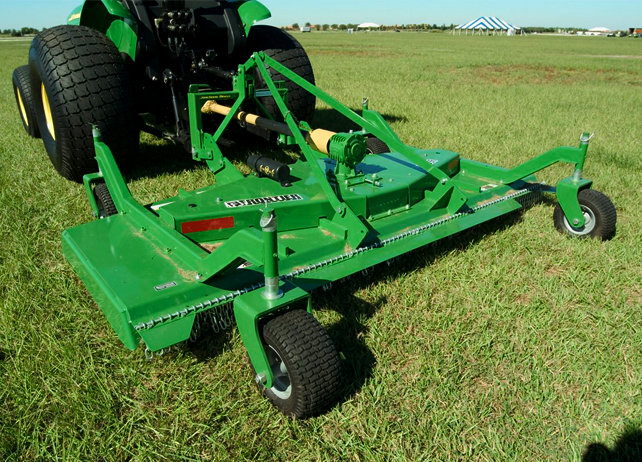 However, if you have a large turf area that’s wide enough for the grooming mower to operate, it can be a great piece of equipment to use when trying to keep the grass neat and sharply cut in a timely manner. For the purpose of these steps, we are going to assume a John Deere utility tractor and an iMatch™ Quick Hitch is being used. After examining the turf area and determining it’s right for a grooming mower, focus on connecting just the top hook on the iMatch to start (everything else will fall into place). Once it’s hooked in, shut down the tractor and lock down the locking levers. Then, connect the PTO by attaching the input shaft from the mower to the output shaft on the tractor. This makes sure the tractor can power the implement during use. After attaching the PTO safety chain, you will be ready to go. To adjust the grooming mower’s cutting height, simply add or remove spacers on the caster wheel shafts. The proper mowing height should be based on the task to be tackled after mowing (aerating, fertilizing, etc.). Lastly, you will want to adjust the pitch of the grooming mower (using the top link adjustment) so the front is slightly lower than the back. This will allow grass clippings to escape out from under the mowing deck. Unlike a rotary cutter, grooming mowers are best used for pieces of land that you’d like to be finely manicured and admired by your friends and neighbors. Visit this page or contact your local John Deere dealer for more information about Frontier grooming mowers.